Coming spring 2016 the Patagonia Rio Gallegos Zip Front Wader. 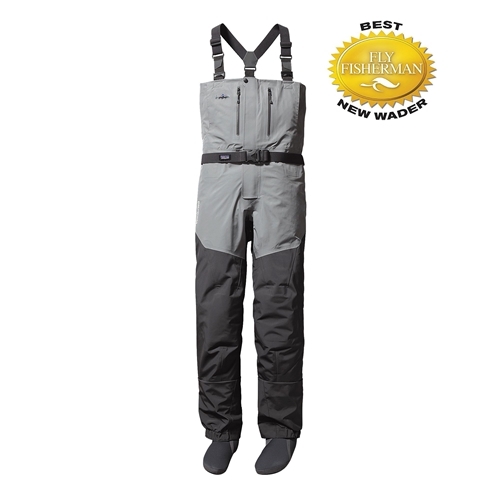 The Rio Gallegos Zip Front Wader keeps Patagonia in the forefront of awards for their waders. The Zip Front feature with a T-zip front zipper will allow easy on access along with all the standard features of the Rio Gallegoes wader. The Patagonia Men’s Rio Gallegos Zip Front Fishing Waders are Patagonia sized fishing waders that is designed with a H2No Performance Standard polyester microfiber shell that features a Patagonia proprietary waterproof and breathable barrier with a NanoSphere DWR finish that is durable and puncture resistant with exterior reinforcements on the crotch for much better abrasion resistance and durability that is another great feature of these innovative men’s king fishing waders by Patagonia. The Patagonia Men’s Rio Gallegos Zip Front Fishing Waders are designed with waist-mounted EZ-lock suspenders for fast conversion from chest to waist high waders. These suspenders are made with a TPU slide-and-lock design on the front and back for added security when deep water wading. The Patagonia Men’s Rio Gallegos Zip Front Fishing Waders are designed with single seam construction to limit the number of seams on the highest wear points on the inside of the legs. These men’s king fishing waders are also designed with an interior welded TPU-waterproof zippered pocket to safely store your valuables and to keep them nice and dry while you are fishing. These men’s king fishing waders also features hand warmer pockets that contains water resistant zippers and a laser-cut Hypalon utility keeper for easy access to nippers and other fly-fishing gear. The Patagonia Men’s Rio Gallegos Zip Front Fishing Waders are also designed with anatomically curved knees that features removable neoprene knee pads and anatomically designed left and right booties that have abrasion resistant soles that are made with 3mm neoprene that are lined with merino wool grid for extra warmth and breathability. These men’s king fishing waders also includes a field repair kit, so make sure to check out these very feature-rich and very innovative Men’s Rio Gallegos Zip Front King Fishing Waders for your next fishing outing. When Patagonia set out to build the finest waders on the planet, the challenge was clear: They had to be tougher, more comfortable and easier to use than anything else out there. Period. We believe our new Rio Wader haa met – and exceeded – the challenge. Built with strategically placed weights of our proprietary waterproof/breathable H2No® Hydrostorm polyester microfiber fabric package, these waders maximize durability while achieving a new standard of comfort and breathability. Our revolutionary Merino wool grid booties – re-engineered for even better fit – wick moisture and keep feet warm in cold water and cool on long walk-ins. A new sliding, infinitely adjustable suspension system converts easily to waist height (or any height you prefer) and allows quick "relief" without having to remove your jacket or wrestle with balky zipper access. High-wear seams feature exterior reinforcement tape for unsurpassed abrasion-resistance and longevity. More details: easy-access, external glued-in water-repellent zip storage pocket; completely submersible, waterproof welded internal pocket; anatomically designed left and right legs and booties; built-in gravel guards with abrasion-resistant scuff zones and high-filtration mesh drainage strips; removable internal knee pads; and a stretch wading belt. In other words, the ultimate wader. Field repair kit included.The Gallegos Zip Front Wadersare Recyclable through the Common Threads Recycling Program. Patagonia’s toughest, most puncture-resistant and feature-rich waders have been fully re-engineered from the booties up. An improved upper-body fit, articulated legs, newly streamlined gravel guards and poly-lined anatomical booties take the Rio Gallegos to a new level of comfort, performance and durability for the most dedicated anglers. Come see us at the shop to try on a pair and check out our entire Patagonia fly fishing line. on 12/7/2017 These Patagonia Men's Rio Gallegos Zip Front Waders are great, period! I'm so impressed with my new Patagonia Men's Rio Gallegos Zip Front Waders that I can't wait to go fly-fishing just so I can slip them on again. They were so comfortable and they kept me completely dry. I hate getting wet and these waders are worth their price hands down!!! Tough to pony up this much money for waders but these are the real deal! Excellent design (zipper!!!) and quality materials. I fish year round in the streams and rivers of West Virginia and these look like they will last a very long time. Service from North Platte River Fly Shop is exceptional as well. Despite using the size chart, I ordered the wrong size. They made the exchange process painless and fast.